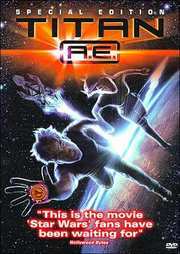 Back Cover of Titan A.E. A reluctant young hero holds the key to the future of mankind in the palm of his hand in this eye-popping, sci-fi adventure. It`s the year 3028 and the Drej, a vicious alien race, have destroyed Earth. Fifteen years later a young man named Cale learns he possesses a genetically encoded map to the Titan, a spaceship that holds the secret to the salvation of the human race. With the Drej in hot pursuit, Cale blasts off with the new crew of the Valkyrie in an attempt to find the Titan before the Drej destroy it, along with mankind`s last chance for a home of their own. Featuring an all-star voice cast that includes Matt Damon and Drew Barrymore and an edgy, out-of-this-world soundtrack, Titan A.E. is an intergalactic thrill ride for a new generation. Lit Music Video: "Over My Head"
The first animated film I`ve sat down to and there`s no outbrust of singing from the main characters and no dumb teletubby plot. A good animation for all of us outgrown disney fanatics. Fox have made a superb film that is meant only for everyone who is now despising Mickey Mouse. And that fox gave us Simpsons and Star Wars, we should be grateful. The film should have gone a bit longer but I was still entertained. If you haven`t yet seen it, do it! Because after seeing this, you would have really wanted to see this film at the cinema. Kevin Wild- The guy who like`s to drink blood...just kidding. When most American films are released, the filmmakers have a target audience in mind. Be it a certain age group, or other demography, the marketing is usually aimed towards these people. With animated features, we usually see the film being directed towards a younger audience, although most quality animation is designed to appeal to adults as well. But, the makers of "Titan A.E." took an entirely different approach and decided to aim the film at America's most fickle filmgoers: teenagers. By employing well-known young actors, and a "hip" soundtrack, 20th Century Fox hoped to bring a new kind of film to the marketplace; an animated film for adolescents. It was such a financial failure that even before the film had been released world wide Fox announced that they were closing their feature animation division. "Titan A.E." begins in the year 3028 A.D. We are introduced to Cale, a young boy playing by a stream on a seemingly perfect day. Suddenly, Cale's father arrives and informs him that they must go at once. The sky grows dark and futuristic helicopters whiz by, as Cale is taken to a military installation. In a rapidly edited scene, we see Cale placed on a spaceship that quickly blasts off, as his father heads for a bunker. As Cale's ship goes into space, we see the ground open and a massive ship, The Titan, emerge and flies into space. Just as Cale's ship gets into orbit, a group of alien ships, The Drej, invade Earth's atmosphere and begin to attack. Then, the Drej mothership aims a force-beam at Earth and blows it to bits, which in turn destroys the Moon.The story then jumps ahead 15 years. Cale (voiced by Matt Damon) is now a young man. He works on a salvage space station, and tries to get along (unsuccessfully) with the aliens. As the lone human, Cale is portrayed as the usual American teenager angry, isolated and alone. Then, a ship docks at the space station, containing Korso (Bill Pullman) and Akima (Drew Barrymore), two humans. Korso confronts Cale and explains that he is the only hope for the survivors of Earth. Cale wears a ring that was given to him by his father, which is actually a map showing the location of The Titan. Cale is reluctant to believe Korso, but suddenly The Drej show up and attempt to kill him. Cale's only choice is to trust Korso and accompany him. After meeting the rest of the crew, Gune (John Leguizamo), Stith (Janeane Garofalo) and Preed (Nathan Lane), Cale uses his map to guide them to a distant planet, in hopes of finding The Titan. But, The Drej are now also convinced that Cale is the last hope for humanity and they will stop at nothing to kill him. Thus begins a race to see who can find The Titan first.I was surprised by how much I liked the style of "Titan A.E.". The animation is a combination of classic cell animation, and 3-D computer generated images, with some special backgrounds thrown. This style gives the film a real texture and a wonderful sense of depth. While some scenes look better than others (it is mentioned in the audio commentary that the production was somewhat rushed), the overall look of the film is very impressive. The "Ice Ring", "Ice Planet", and "Space Angels" scenes are especially fascinating. Unfortunately the character designs fall somewhere between cartoony and realistic and never quite look right. Also the production uses muted colours, except for The Drej, who are a glowing electric blue.While the animation is top-notch, it's the lack of story in "Titan A.E." that brings the film down. There were probably too many cooks in the kitchen, as it took five writers to come up with this uninspired, hackneyed yarn. The idea of the Earth being destroyed and the survivors trying to start a new world is a staple of Sci-Fi, but it just gets lost in "Titan A.E.". The Drej, being faceless glowing blue things, are the stock Want-To-Take-Over-The- Universe-For-No-Readily-Apparent-Reason villains, and just don't cut it. Everybody else, humans and aliens, are stereotypical characters, who we've all seen before in other films. "Titan A.E." boasts some passable voice acting (Nathan Lane as Preed is OK) but the three leads are just going through the motions and you will find that you just didn't care what happens to anyone.